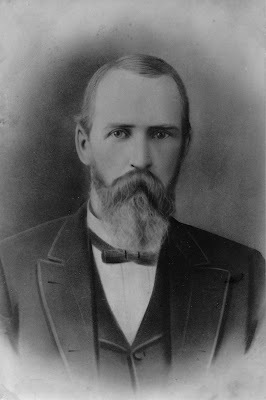 Today I'm featuring a photo of my great-great-grandfather, Jacob C. Grow. He was born February 5, 1844, in Carrollton, Georgia (west of Atlanta, near the Alabama border), to Paschal Paoli Grow and Elmyra Wolcott Grow. Carrollton was at that time a pioneer town and Jacob's parents had arrived a few years earlier, coming from Hartland, Vermont, in a Jersey Wagon to be the teachers at the first school. When the Civil War broke out, Jacob's older brother immediately volunteered for the 8th Georgia Infantry and participated at the First Battle of Manassas but succumbed to typhoid fever in September of 1861. Jacob and his younger brother, Lewis, were about to join when their father died, so after things were in order they both brought their horses to enlist the 7th Confederate Cavalry in the middle of 1862. Lewis died at Petersburg in 1864, but Jacob was with General Johnston at the surrender of the Confederate Army. Jacob returned to Carrollton, Georgia, and decided to become a minister. He enrolled in Columbia Seminary and while a student, he met Margaret Scott from Sumter, South Carolina. He graduated from seminary and they wed in 1873. He went on to pastor Presbyterian churches (typically in rural and frontier areas). His first pastorate was in what is now Lake City, Florida. Form there he pastored churches in Jefferson County, Georgia, and then in 1887, out in Texas (Sulphur Springs, Llano, Burnet, Comanche, Dublin, and Hamilton). He actually worked as a traveling minister often preaching in multiple churches each Sunday and riding between the congregations. Working in poorer areas, he was often paid in chickens or other small livestock. Jacob and Maggie had five children. There was Paoli, Mary, Will, Elmira, and Marguerite. Paoli became a Baptist minister. Mary was my great-grandmother. Will remained single and worked in the oil industry. Elmira died at age seven in 1891. I've seen several drawings that Elmira made for her father which he saved. Marguerite was a surprise child, born in 1892, nine years after the last one. Marguerite remained single and became a Latin teacher at the Hockaday Girls School in Dallas. Jacob died in 1903 at age 59 and he's buried in Gainesville, Texas. Valdosta, Ga. Dec 26th 1903. I have just learned of the death of your husband & My Cousin, & I assure you it was a very severe shock to me. When I met him in Fort Worth, Texas, at the reunion held at Dallas, Texas, he seemed in the best of health & spirits and I was wholly unprepared for the sad intelligence. He served under me three years in N. Carolina & Virginia & was absolutely fearless in the discharge of any duty assigned him. He enlisted at Carrollton, Ga. June 16th 1862 and remained with his company until the close of the war in April 1865 - when we came back to Carrollton together. If I remember correctly, you & he were married in Florida, while he was in charge of the Presbyterian Church at Lake City, and another church near there. To the silent halls of death. If you feel so disposed I would be glad to recieve the particulars of Cousin Jacob’s death. Jacob Grow seems to have led a very productive life and one very rich in experiences. Wouldn't it be great to read a diary or autobiography he wrote? Also, the bereavement letter written by his cousin outclasses anything likely to be written nowadays, I think. Interesting life story. Still he died so young. You do not know me but I live in the house that Jacob built or had built in Llano TX. The house is believed to have been built around 1893-1897. We did find a check written to his wife dated 1893. I have been compiling information on him for a while but loved the personal touches you put in your blog. I have the army picture but not the picture of him and his wife. I would love pictures (via email) especially from the time period he was here in Llano. I don't know if this house would be in any of them but that would be a special find. I can send you old pics of this house if you like.